For most of us, arcade sticks are part of our embedded memories of younger years. For the more geeky, like me, you could still recognize the feel of the buttons in your hands. That Japanese component, whack a billion times and still work and feel like new, quality. Players have been relegated to using console gamepads and computer keyboards. 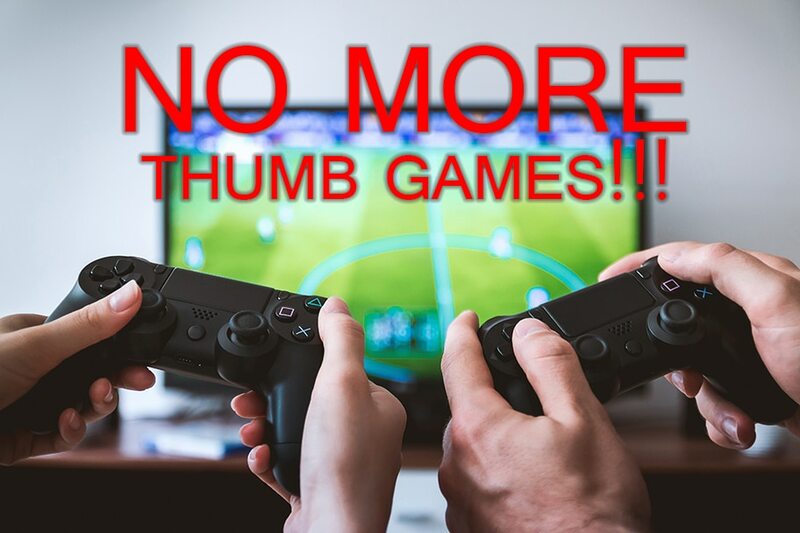 We have been tricked into believing we should play games, and even fighting games, with our thumbs. Our THUMBS! What many gamers don’t know is these controllers still exist! Not as some super expensive, custom-made toy for rich kids with a gaming room in their basement. 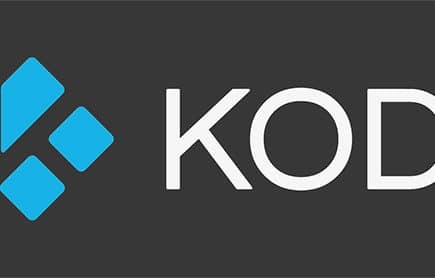 Tournament quality fight sticks, with the same components, are available for every major console. A good fighting stick is serious hardware for serious players or die-hards who refuse to twiddle their thumbs. We’ve profiled the 4 best fight sticks being made today. Because we’re geeky like that. The F500 Universal is a step up from the Mayflash F300 and is the most advanced model to date. It is the premier budget arcade stick. 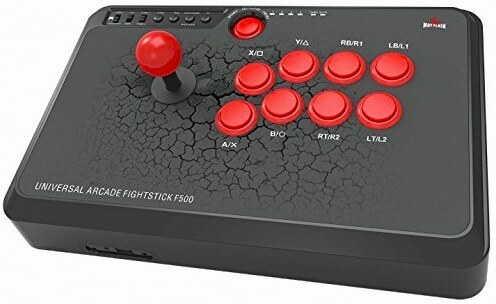 It is priced under $90, and there are no great sticks to be found at a lower price point (the Mad Catz Street Fighter V makes for good fighting but not great), so this is a good starting point for our baseline. It’s actually great value for the money and, if your budget is tight, this Mayflash and the KINGTOP stick are the only 2 joystick controllers to consider buying now. Compatibility – Xbox One, Xbox 360, PS4, Android, Switch, and PC. Interface Layout – 8 buttons on the face, including start, 2 mini buttons, 4 for more advanced options, and a mic mute button. Control – D-Pad or Analog. Audio – Headphone and microphone ports. Turbo – One press can do the work of 15 presses per second. PS 4 Features – Full, including the touchpad, Share, and PS button. 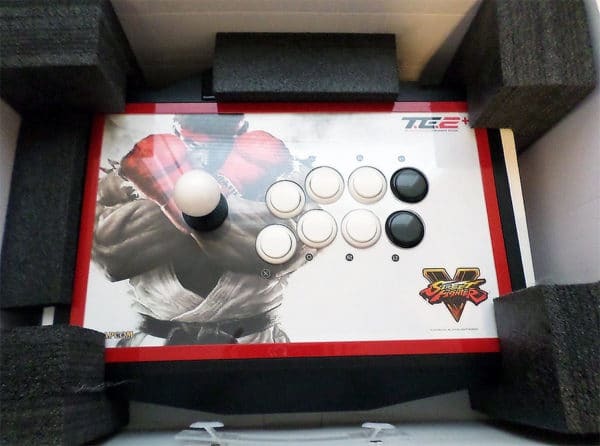 Although regarded as an entry level fighting stick, this edition does provide room for modding and upgrades. The F500 uses Sanwa Denshi buttons and joysticks, generally regarded as the best because they are used in real Japanese arcade games. Japanese arcade games are considered the gold standard by which all other gaming is measured. So, you can mod or upgrade later without buying a whole new platform. 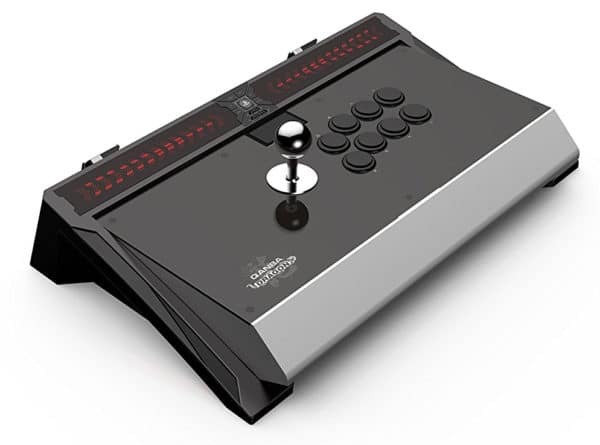 The F500 is weighted down with two metal plates (one at the base and one for the cover), and mounted on rubber feet to keep it from sliding around and keep you in fighting games, which is a feature we particularly like on this fightstick. 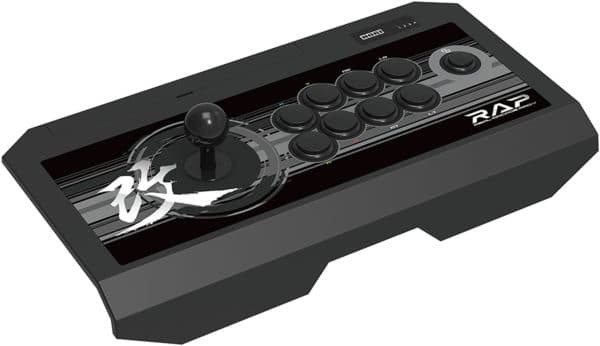 The other entry level arcade stick we would recommend for fighting games is the KingTop. Personally, I like to use the previous fight stick better. It feels a little more substantial to me than the KingTop, and it’s also upgradable and cheaper. But, it wouldn’t be right for me to leave out the only other stick within the price range that is worth taking home when my preference is not very strong. What should probably make the biggest difference to you is the button layout. This is totally a subjective preference, and based on how you fight, so look closely at the layout of the buttons and the angle on the KingTop and the Mayflash before making your choice. Works With – PC, Xbox One, Xbox 360, PS3, and PS4. Interface Layout – 8 Multi-Speed Buttons. Storage Access – Compartment on top to store the USB cord. The KingTop also has a rubber anti-slip pad to ensure the fighting stick will stay firmly in place during use, but it lacks some of the weight of the Mayflash F300. This should be considered as a good thing if it is going to be sitting on your lap, but not good if it will be sitting on a solid base while you are fighting. The HORI Real Arcade Pro 4 Kai is a Sony licensed intermediate fight stick with noticeably better quality than one of the entry level sticks. HORI uses a HAYABUSA joystick and the new HAYABUSA buttons. The new buttons are a little lower profile, have a matte finish, and the design uses more rounded edges to enhance gameplay and reduce fight reaction time. The HAYABUSA parts are used in arcade machines, which is the standard by which to measure component quality. The step up in quality can also be seen in the extra functions the stick features. This includes multi-speed buttons, L3/R3, and a cable that’s just under 10 feet long. Critically, functions are not locked in and buttons are fully assignable for how you choose to fight and ready for modding. Compatibility – XBox One, XBox 360, PS4, and PC. Turbo – Adjustable to 5, 12, or 20 times per second. PS 4 Features – All features of a regular controller, with the touchpad, Share, and Playstation switch. There are 2 problems with this stick, though these problems may not matter to everyone. The HORI Pro Kai stick comes with only a square restriction plate so doing some circular fight combinations can be difficult. It can easily be replaced with an octogonal one, but it would be great to have it in the box. The other issue is that the buttons are a bit sensitive. If you have a tendency to play lightly on the buttons when fighting, then this should not be a problem for you. However, if you are prone to brushing across them as you are fighting, you would be better served by another fight stick. Both of the problems above are really a matter of taste and fighting style. For me, this is my choice of stick for Street Fighter. It feels right and response time is great when playing one of the classic games of all time. In short, it’s just more fun with a stick like this. Overall, the HORI RAP4 made an excellent impression and is well worth the money. The best selling mid-range fight stick for PS3 and PS4 has been a popular choice for years, with good reason. 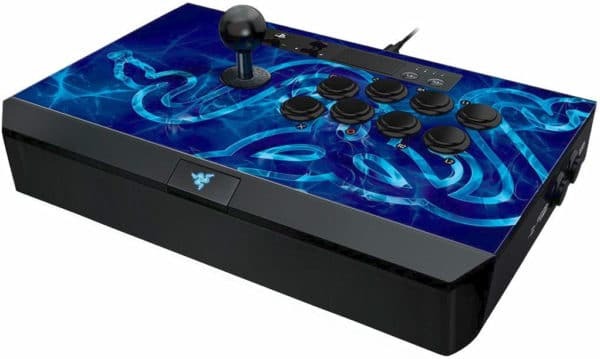 Mad Catz Street Fighter V Arcade FightStick TE2+ for PlayStation4 and PlayStation3 is a formidable weapon. With a classic button layout, artwork, Sanwa Denshi parts, and easy modding, it makes a good first impression and has received rave reviews online. Unfortunately, first impressions fade. There is a known and persistent issue with the PCB for the joystick, which will cause ghost inputs. There have also been reports of similar issues with the buttons, which doesn’t exactly provide a decent arcade fight experience. Mad Catz customer support for these problems is great, but if quality control is poor enough that an issue like this keeps creeping in over months or years then we can’t recommend it to our readers. The closest competition for the Mad Catz is the HORI RAP4, which is cheaper and better built, and Amazon reviews directly comparing the sticks favor the RAP4. 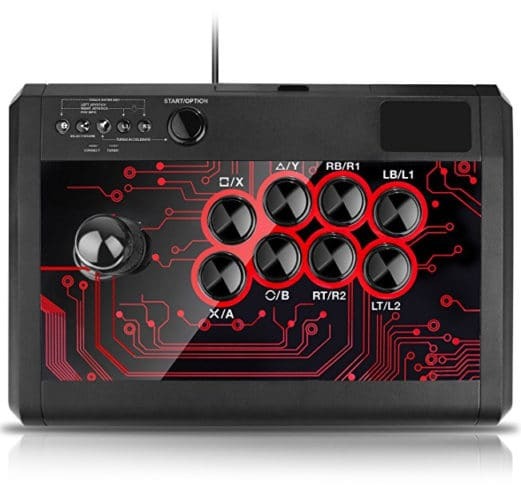 In spite of what you may read about the Mad Catz stick elsewhere, do not buy this fight stick! Razer is known for making a lot of top end gaming products, and this fight stick is no different. It is lightweight, extra smooth when gaming, and is a feature-rich stick with top-notch parts in terms of hardware and internals in addition to having buttons that are customizable for each gamer’s needs. This arcade stick is a device that has been created with very precise specifications for gaming comfort, speed, and movement. Professional gamers provided feedback to help develop and perfect this stick for tournament or competitive play. There was also a lengthy series of tests conducted and prototype models designed in order to arrive at the final stick. That final stick includes a number of impressive benefits you can feel in a fighting game. Most importantly, it uses authentic Sanwa buttons and components. Having components that are found in arcades is what generally separates inexpensive sticks from the models with a premium price. Sanwa buttons and sticks are the best components that you will find in an arcade. Compatibility – PC, PS3, and PS4 (not XBox). PS 4 Features – All the functions of a regular controller. Cable Management – Compartment inside. 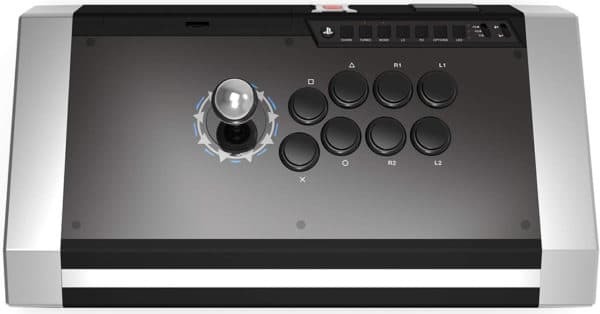 The Panthera is the 1st of our 3 premium fighting stick platforms. As such, it’s irritating that they did not include an octagonal restrictive plate, though the price is cheap on Amazon, and it’s easy to change. And that was our only complaint with this fight stick, which is quite an accomplishment! The buttons are the highest quality that you will find anywhere, the layout feels good and much more true to the experience we are seeking. Our final 2 arcade sticks feel more truly Japanese in nature, both in design and actual feel. For those of us who grew up in western arcades, the Panthera will feel the most like your memories. Let that make your decision, as these final 3 are all truly great sticks. The Qanba Obsidian is a true Japanese fight stick. The design, styling, component choices, and feel are out of a Japanese arcade, not an American one. Upon unboxing, the most striking things are the metal ball top stick and aluminum alloy sides. Even for us, this had a feel unlike any other gaming device we have touched. If you want the arcade experience that your hands remember from your youth, this is not the right arcade stick for you (unless you grew up in Japan). But, if you want a high-end arcade experience, this is what you have been looking for. The Qanba arcade stick features a Sanwa JLF joystick and Sanwa OBSF 30mm buttons. Translated, that means it uses the best and most durable parts which have been proven in arcades. It is also Sony licensed so it will be fully compatible with everything on PS3 and PlayStation 4, while being PC compatible too. Unfortunately, it is not compatible with XBox One. The stick is equally striking when you examine the accessory controls, including multi-speed buttons, L3 and R3 buttons, as well as the pad. PS 4 Features – All the functions of a regular PS 4 controller. Storage – Built-in compartment to store the cord. Though just around 7 pounds, the arcade stick feels like you are resting your hands on an arcade game cabinet. There is no flex while you are fighting. It is responsive, as in there is zero lag with this arcade stick. As hard as I try to find something wrong with everything, because I am picky, the only thing I can find to grumble about is that it does not come with an octagonal restrictive plate. Yes, it’s easily changed, but I want my octagonal! For the best Japanese arcade fight experience, this and the Dragon are the only choices. This stick is the best truly Japanese style arcade stick made. It is both a collector’s piece and a tournament-worthy joystick. The Dragon has been used by professionals and e-athletes around the world, including EVO champions, who hold it in high regard. PS4 Features – Full functionality of a regular PS4 controller, even the touchpad. Weight – A solid 11.6 pounds! 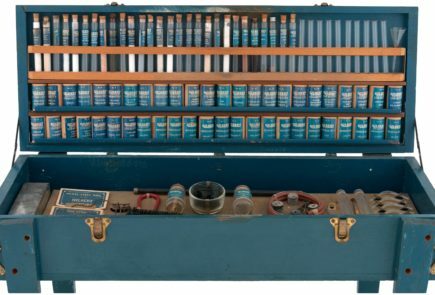 Storage – 8′ 5″ Braided and reinforced cord wraps around hooks on the rear. Being officially licensed through Sony, it is compatible with a wide range of titles. It can also seamlessly transition between different consoles with minimum setup time or delays. What these sticks offer, more than anything else, is superior design and build quality that is made to Japanese home-market standards. It feels almost foreign at first because in the United States we are not used to a gaming device, or video games in general, being held in such high regard that a component feels more like a luxury item. We would never put this degree of thought, detail, craftsmanship, and money into developing something this fine. The aesthetics, durability, function, and build quality of this arcade stick just really doesn’t leave anything to be desired. I would still complain that it doesn’t come with an octagonal restrictive plate. But, quite frankly, I don’t care. It’s easy to swap out, and I get to admire the beauty of the inside while I do it! How special is it? They even make an $80 padded carrying case specifically designed for the Dragon. For gamers that want the absolute best, the Qanba Dragon is the best fight stick that money can buy. If you can afford the price tag, buy it!